Selected Works of David O Moveh PhD. One manifestation of Nigeria’s crisis of governance since the advent of civil rule in 1999 is the spate of youth violence that has characterized the electoral process. From the plains up north to the creeks in the south, Nigeria’s electoral process within the past decade has been mired in violence so much as to make mockery of the democratization process. A lot of works (Bangura: 1997, Momoh: 2000, Yau: 2000) have studied how Nigeria’s economic crisis and the attendant structural adjustment programme of the 1980s resulted in the alienation and marginalization of the youth, thereby exacerbating the whole phenomenon of youth restiveness in general. However, very few works have attempted to study the relationship between competition for political power and youth restiveness under the current “democratic era”. This paper is an effort in this regard. 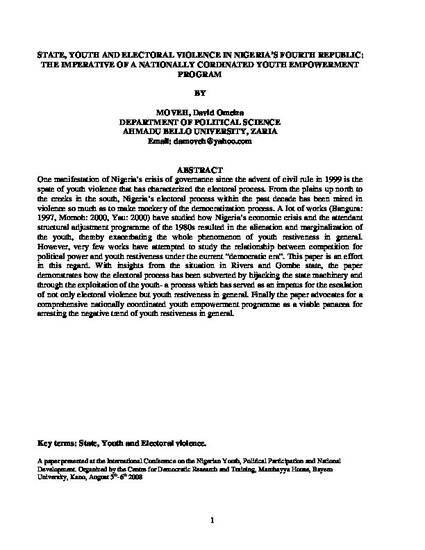 With insights from the situation in Rivers and Gombe state, the paper demonstrates how the electoral process has been subverted by hijacking the state machinery and through the exploitation of the youth- a process which has served as an impetus for the escalation of not only electoral violence but youth restiveness in general. Finally the paper advocates for a comprehensive nationally coordinated youth empowerment programme as a viable panacea for arresting the negative trend of youth restiveness in general. Contact David O Moveh PhD.